These sweet potato tacos are as delicious as they are beautiful to look at. Taco night really is awesome: tortillas keep easily in the freezer and thaw quickly, toppings are generally easy to throw together, and everyone can assemble their own tacos the way they want them- practically the definition of family friendly! I love traditional tacos with savory and satisfying ground meat, blackened fish, and even shrimp. But I wanted to try something a little lighter – still savory, but a little sweet as well. 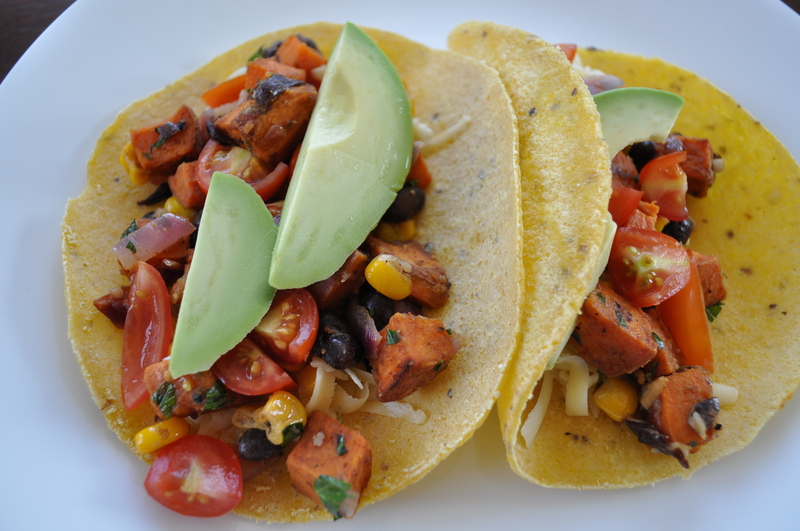 So I browsed around for inspiration and found these Honey-Lime Sweetened Sweet Potato, Black Bean and Corn Tacos at cookingclassy.com. I adapted the recipe a smidge – reducing the sweetness and adding a jalapeno for flavor and spice. The results were delicious and surprisingly fast to prepare. I remember looking at my clock and thinking I had a good 10 minutes of empty space to fill before I needed to call the kids to the table (at this point in life that feels like practically an eternity, and it’s not a feeling I have often while preparing dinner!). My husband doesn’t like sweet potatoes, so I simply pulled some of the bean and corn mixture aside before mixing in the sweet potatoes. You could certainly do the same if you have a sweet potato non-eater. Again, the beauty of tacos! Pre-heat your oven to 415 degrees. Toss the cubed sweet potatoes in a bowl with about 2 tablespoons of oil (melt the coconut oil first if necessary), cumin, paprika, and some salt and pepper until well combined. Spread them out single layer on a baking sheet and roast for 10 minutes in the middle of the oven, then flip and roast for another 10 minutes until tender when pierced with a sharp knife. While the sweet potatoes are roasting place a large skillet over medium heat and add a drizzle of EVOO. Saute the minced onion until sweet and tender, about 5 minutes. Add the jalapeno if using and saute for another 3 minutes. Add the garlic and saute for another minute until fragrant. Add the beans, corn, juice and zest from 2 of the limes, 1 tablespoon of honey, and some salt and pepper. Saute until heated through. Turn off the heat and toss with the sweet potatoes when they’re done cooking, as well as fresh herbs if using. We tried this one tonight and loved it!